Most large telescopes are designed to look at tiny regions of the sky for minutes or hours at a time. These views allow the telescope’s instruments to observe objects that are extremely faint and far away. But a telescope that is under construction in Chile is taking a different approach. The Large Synoptic Survey Telescope (LSST) will take brief snapshots of wide areas of the sky. Using this approach, it will photograph the entire sky every three nights. Project scientists say this makes LSST a perfect tool for studying dark energy. Over several years, it will view millions of galaxies and a million or more exploding stars. These observations will allow LSST to use several techniques to probe the effects of dark energy across much of the universe. One key LSST goal is to map the distribution of massive clumps of dark matter. The gravity of these clumps deflects the light of the visible galaxies behind them, slightly distorting each galaxy’s apparent shape. By measuring these distortions, along with the colors of the galaxies, astronomers can map the distribution of both the galaxies and the dark matter at different times in the history of the universe. Since the way matter is distributed depends on different models of dark energy, producing accurate 3D maps of the universe at different times will help scientists narrow down the possible explanations for dark energy. At the same time, LSST will help scientists probe the baryon acoustic oscillations — the imprint of sound waves in the very early universe. This imprint is preserved in the distances between galaxies. LSST’s maps of the sky will allow scientists to measure distances between galaxies at different epochs in the history of the universe. Changes in the distance scale as the universe ages and expands reveal the influence of dark energy at different times. Each potential explanation for dark energy predicts different patterns for the changing distances, so accurate maps will help scientists eliminate some possible explanations and refine others. Since LSST will photograph the sky over and over, it is a good tool for discovering and studying the exploding stars known as supernovae. A certain class of supernova, which is bright enough to see in distant galaxies, brightens and fades in a predictable way, so measuring the changing brightness of these stars can reveal their distances. In conjunction with other telescopes, LSST also will measure how fast the parent galaxies of these exploding stars are moving away from us. The combination of distance and motion reveals the expansion rate of the universe at a given moment in time, so measurements of a million supernovae will reveal the expansion rate at many different times, revealing the influence of dark energy at each of those times. 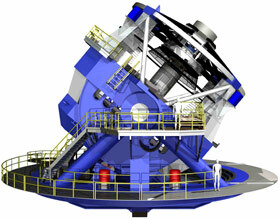 LSST will use a single 8.4-meter (356-inch) primary mirror combined with a large CCD camera. It will take a series of 15-second snapshots of the sky, with each one covering 10 square degrees — about 50 times the size of the full Moon. All of its images and other observations will be made available to the world almost instantly via the Internet. 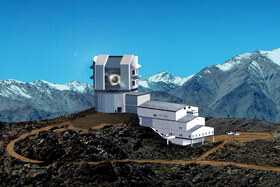 LSST is scheduled for completion atop Cerro Pachon in Chile in about 2020.